First seen at 06m45s, this location features throughout this episode. 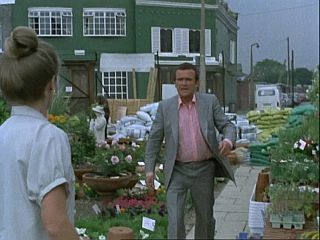 The garden centre has now been built on, only the buildings on the left comparable with that of the episode itself. 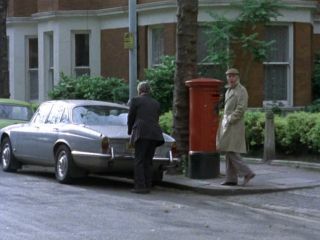 At 07m26s, Terry collects George Wilson, who he believes to be Albert Stubbs from Wormwood Scrubs. 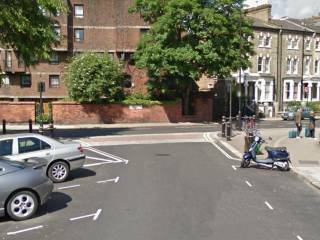 This location also features in #9.6 Gone With The Winchester, #3.7 The Birdman Of Wormwood Scrubs and #10.9 Bring Me The Head Of Arthur Daley. They then travel along Du Cane Road. 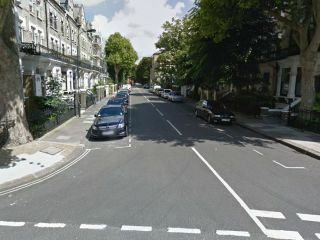 While being chased by Rose they turn into Artillery Lane, just off Du Cane Road. 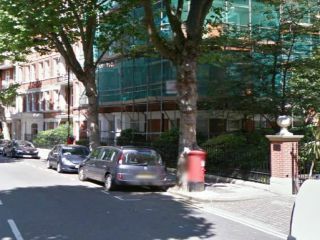 This lane runs between the prison and Queen Charlotte's & Chelsea (formerly Hammersmith) hospital. At 17m19s Terry looks for Stubbs's double George Wilson in The Bricklayers Arms. This pub has been known more recently as 'The Kensington' and by 2014 had been demolished. This location also features in both #1.9 Monday Night Fever and in #2.9 All Mod Cons. 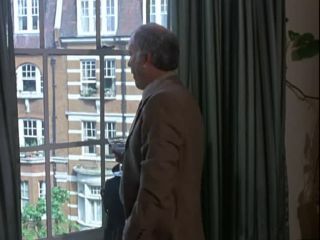 At 25m53s, we see the interior of Arthur's flat. 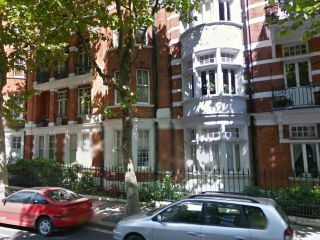 At 26m32s as Albert looks out of the window of North End House we see a view of the building opposite. 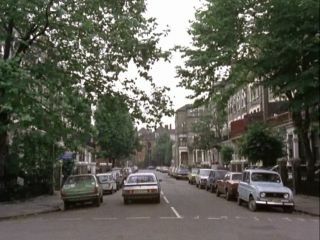 At 37m12s, Terry, Rose & Jack arrive opposite Arthur's flat and see Arthur & Stubbs leave in the first mini with a shovel. This is just along the street from North End House. 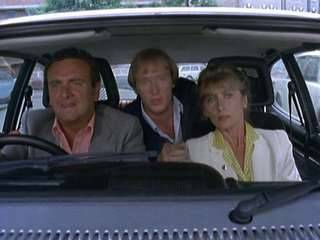 At 36m29s, Jack's silver Capri passes this location as Terry takes him & Rose to see Stubbs at Arthur's place. This exact same location also features in #1.11 You Gotta Have Friends. At 36m44s Terry tells Jack to take the first left. It is here they turn into Auriol Road. Note the matching chimneys. 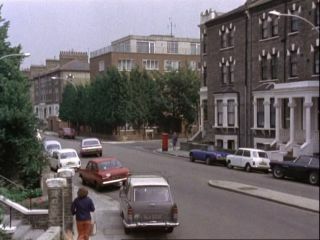 Moments later they all turn from Gwendwr Road into Glazbury Road, the exact location of Terry's flat from series 2 onwards. 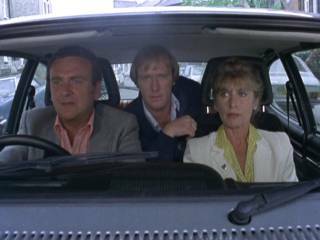 At 37m58s, Arthur jumps into a second mini while Stubbs drives into the back of a truck as a diversionary tactic. As one mini is loaded into the back of a lorry, the other ones drives off. All this happens near the corner of Glazbury Road. This same location (from the opposite side) is also seen in #1.11 You Gotta Have Friends. 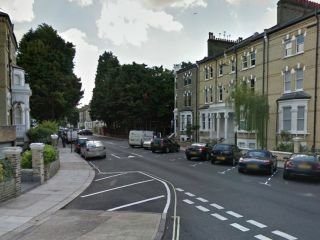 At 39m14s, Arthur & Wilson turn from Edith Road into Trevanion Road where Arthur says they are going on a little 'mystery tour'. At 41m07s Rose and Jack follow Arthur and Wilson up from Talgarth Road on to the Hammersmith flyover. 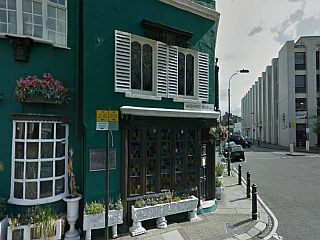 At 41m18s, we see a clear view of the building opposite Hammersmith Apollo on Queen Caroline Street from Jack's Capri.